If you're looking at a Porsche or Ferrari, fuel mileage is probably not your main concern. Computer enthusiasts take a similar approach to choosing top of the line gear for a new PC or upgrade project. Energy consumption be damned! Or so it goes... The computer industry has taken it upon itself to tackle the issue of skyrocketing power demands, and it's reassuring to see most new chipsets, CPUs, and everything other than the videocard draws a little less power than its predecessor. nVidia and ATI on the other hand pump out power hungry chips as if they were the oil company. But that's another story. When it comes to power consumption, the lower it goes the less heat there is to deal with, the longer things last, and most importantly the quieter computers will run. That, or manufacturers can employ some fairly complex and gigantic thermal solutions to keep temperatures in check. I often marvel at the fact that a modern PC doubles quite effectively as a space heater in the dead of winter. That's the price computer enthusiasts have to pay for the pleasure of running a fast rig, but at least your feet will stay warm. Now, since you're in the market for a high end motherboard with high end options to match, there are really only two options you should be looking at now. Technology changes quickly, but for the time being Intel's Core 2 Duo and a motherboard packing nVIDIA nForce 680i chipset are the most expensive combo available. A lack of options makes choosing a little easier, and monopolies aside both companies have done an excellent job at keeping performance and innovation to a high level. The Asus Striker Extreme is no doubt one of the most extravagant nVIDIA nForce 650i motherboards on the market. The price tag is pretty impressive too (see the full list of boards PCSTATS has tested here). ASUS' P5N32-E SLI Plus motherboard is based on the same PCB design as the super nice Striker Extreme, you just don't have all the little extra lights and things catering to the case mod crowd. Hardware features are the same, and you can bet performance will be too. ASUS' P5N32-E SLI Plus motherboard packs in a tone of Serial ATA II ports thanks to the nVidia nForce 570i MCP Southbridge, yes Asus reuses an older MCP but that's ok because it's still packed full of features. Expansion options include a single PCI Express x1 slot, two PCI slots and three PCI Express x16 slots (two running at PCIe x16 for SLI compatibility and one at PCIe x8 speeds), and one dedicated audio slot for the bundled sound card. The motherboard supports all current socket 775 Intel processors from the Celeron D, Pentium 4/D/XE right through to the Core 2 Duo. The Asus P5N32-E SLI Plus even supports Intel's upcoming 1333 MHz Core 2 Duo/Quad processors, otherwise FSB's of 1066/800/533 are standard. The board has four DDR2 memory slots, and will accommodate up to 8GB of DDR2-800/667/533 memory. SLI ready memory (aka. EPP) at speeds of up to 1200MHz is supported. Peripheral-wise, the P5N32-E SLI Plus motherboard comes bearing six 3GB/s SATA II channels with support for RAID 0, 1, 0+1, 5, JBOD, dual Gigabit network ports (nVidia DualNet supported), a silent chipset cooling system on the boards' power circuitry, dual IEEE 1394a ports, 10 USB 2.0 slots and one Ultra DMA IDE channel. ASUS' SupremeFX Audio Card provides 7.1 channel High Definition audio capabilities, along with jack sensing ports, multi-streaming and jack-retasking. Audio outputs include coaxial, optical S/PDIF and DTS connect. No matter how you slice it, the ASUS P5N32-E SLI Plus has almost everything a professional computer user needs. The P5N32-E SLI Plus is not cheap but compared with its specis and integrated features it's a steal at $230 CDN ($197 US, £102 GBP). User's Manual, Driver DVD, WinDVD Suite Enhanced CD, PCI Express x1 Soundcard, Microphone, 1x Ultra/133 IDE Cable, 1x Floppy Cable, 6x Serial ATA Cables, 3x Dual Serial ATA to Molex Power Cables, Heatsink Fan, 3x Transistors, Zip Ties, Asus Q Connector, USB Bracket, IEEE 1394 Bracket. As mentioned earlier the Asus Striker Extreme and Asus P5N32-E SLI Plus share the same design. Both motherboards take their design and connector layout from the Asus P5N32-SLI Premium, with a few tweaks here and there. 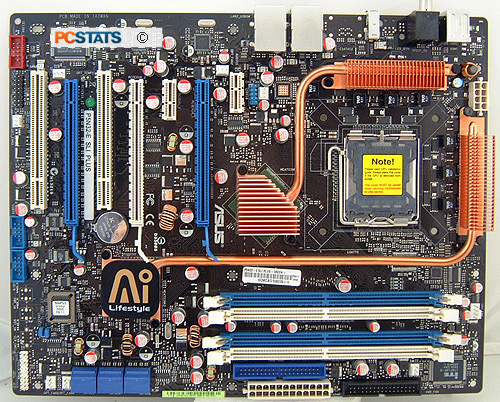 On the whole the Asus P5N32-E SLI Plus motherboard is user friendly and easy to install. There are a couple of noticeable jacks that are absent however. The Parallel printer port and Serial ports are two prime examples of absent ports, which are not implemented at the header level either. The CPU heatsink fan plugs into a 4-pin PWM compliant fan header, but this is backwards compatible with the 3-pin variety. As a matter of record, all 4-pin PWM fan headers will work with legacy 3-pin fan cables from yesteryear. The user's manual that accompanies the Asus P5N32-E SLI Plus is top notch, and it will guide you though the relevant steps of installation and troubleshooting. It's one area where Asus really excels. For example, there are three pages alone dedicated to "how to install and remove" the CPU heatsink properly, Asus certainly doesn't overlook the small details. While the Asus P5N32-E SLI Plus motherboard is compatible with older 20 pin ATX power supplies, PCSTATS strongly recommends an ATX 2.0 power supply with the ESP12V connector. Modern systems require a lot of juice, and it's definitely not worth your time to cheap out on the power supply. Considering the target audience and users, it would have been nice if Asus could have integrated a secondary Serial ATA II RAID controller onto the P5N32-SLI Plus motherboard. eSATA is quite popular, and PCSTATS would have expected Asus to put an eSATA port on the rear I/O to accommodate the external data storage needs professional users are likely to have. A significant feature on the Asus P5N32-E SLI Plus motherboard is the manufacturer's decision to equip the board entirely with solid state capacitors. It looks like all manufacturers have moved quickly on this trend, as it provides greater stability and product longevity. A few years back there was a huge problem with motherboards suffering from burst and leaking electrolytic capacitors. This industry-wide event blossomed into a full blown epidemic, and single handily dragged ABIT's name through the mud if you recall. 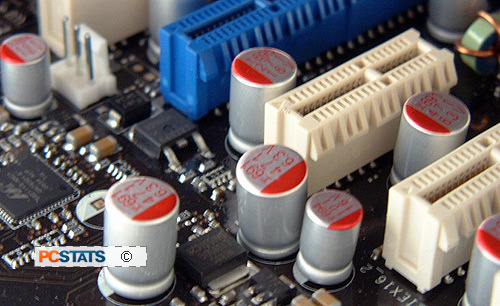 The Asus P5N32-E SLI Plus uses conductive polymer aluminum solid capacitors of the kind pictured right. These are the same type of capacitors mostly found on videocards, or in the CPU's power supply circuitry. The gist of the situation is that Asus have produced a motherboard with only this kind of capacitor, because it improves overall stability of the motherboard in the long term (we're talking 3+ years). Being a solid device, the physical conditions which caused poor quality electrolytic capacitors to burst after 3 years is a non-issue. If you'd like to read up on the back story that led to the whole problem of burst and leaking caps, have a look at this PCSTATS article. It's actually a rather complicated story of industry espionage. Solid capacitors are slightly more expensive than regular electrolytic capacitors, however compared to other nVIDIA nForce 650i motherboards the Asus P5N32-E SLI Plus is still quite aggressively priced.